During his patented Special Comment segment last week, Countdown host Keith Olbermann showed his displeasure with President Obama’s compromise on the Bush Tax Cuts by comparing it to Nazi appeasement. At Monday’s White House briefing, I asked Press Secretary Robert Gibbs if the White House had any reaction to the comparison. Gibbs responded that he doubted the President had heard Olbermann’s remarks, reiterated that the White House thinks the compromise is a good deal, and addressed the appeasement charge. See Gibbs’ response after the jump. Tommy Christopher: Thank you, Robert. Thank you, Les. I have three quick questions. First one, last week during his Special Comment, Keith Olbermann compared the President’s tax compromise to Nazi appeasement. I wanted to see if you guys had a reaction to that. Did the President hear that? Or, what do you think about that? 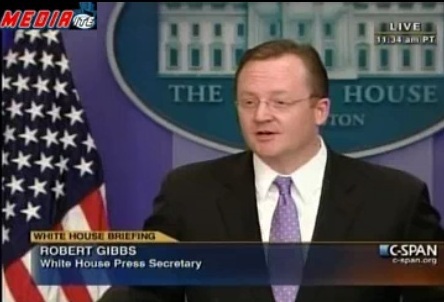 Robert Gibbs: I doubt the President heard that. I, obviously, have given a number of answers that would denote that we think it’s a good agreement.And…I would say this to Democrats or Republicans, whenever you compare anything to what the Nazis did, if you ever get to that point in your speech, stop. Because nothing does, and hopefully, God willing, nothing ever will. The entire point of Godwin’s Law, of course, is that those who violate it make themselves irrelevant. In the case of Keith Olbermann, though, a little light Nazi rhetoric isn’t going to break the spell he has over much of the President’s base. While Bill Clinton‘s Friday appearance at the White House may help to sway rank-and-file Democrats, the former President is no hero to the Kos nation over which Olbermann holds sway. Appeasing them may be a tricky thing.